This project proposes new scheme for long-range (~10 mm) on-chip, digital signaling in a conventional digital CMOS process. Unlike other schemes, there is no requirement for up-conversion, equalization, or special metal processing. The new scheme eliminates the dispersion associated with long lossy lines, allowing very high rates (>40 Gb/s) to be achieved. Eye diagrams, based on line characteristics derived from EM simulation, indicate minimal inter-symbol interference at 40 Gb/s. J. 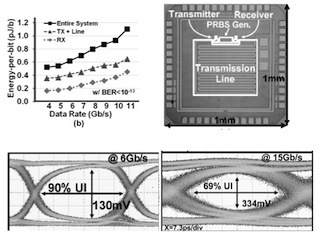 Park, J. Kang, S. Park, and M. P. Flynn, “A 9Gbit/s Serial Transceiver for On-chip Global Signaling over Lossy Transmission Lines,” IEEE Transactions on Circuits and Systems I, October 2009. M. P. Flynn and J. Kang, “Global Signaling over Lossy Transmission Lines,” in International Conference on Computer Aided Design (ICCAD), November 2005, (Invited).